Rebecca Sullivan is a self-taught cook and has worked with some of the world’s best food producers, academics, activists, and chefs. A food curator, sustainable living advocate, Author, urban farmer and entrepreneur having recently founded Australian Native wellbeing brand Warndu with her Aboriginal partner Damien. Rebecca has worked on many projects any food lover would envy, from launching the Real Food Festival in London to working on Slow Food Nation in San Francisco, farming coffee in Uganda to teaching scientists in the Maldives for the United Nations. Rebecca completed her Masters in International Rural Development and Sustainable Agriculture at the Royal Agricultural College in Gloucestershire, UK during which she focused on food security and a sustainable food future. Rebecca’s obsession with food began in Italy, so it followed course that she would become interested in the Slow Food Movement in which she spent years working with them in the UK organising events, campaigns and of course eating. After a decade working overseas, she has re-settled back in Australia and has launched The Granny Skills Movement in Australia – a community-supported movement inspiring women to be more in touch with the land and old crafts, such as how to be a butcher, a baker or a candle stick maker. Protecting the skills, heritage and traditions of our elders. As well as consulting to organisations, running events, catering, education and strategy work in and around the food, environment and lifestyle sectors and sustainability. Rebecca’s second book, “The Art of the Natural Home”,comes out May 2017. 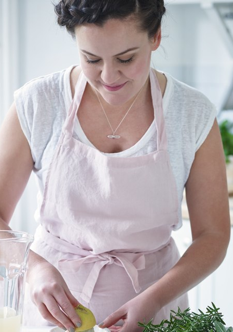 Her first book “Like Grandma Used to Make”, came out in April 2013 with a huge amount of great press including being listed in the top ten books for Mothers Day in The Age, The Sydney Morning Herald and Woman’s Day. Wish Magazine in The Australian has called her "A veritable modern day Mrs Beeton”. She is writing her third book now, “Cook & The Farmer” in which all proceeds go to mental health awareness in rural Australia. In 2012, Rebecca signed on as a presenter on Love to Share on the TEN Network in Australia, has appeared regularly on Channel TEN’s The Circle and Breakfast Shows, as well as Channel Nine’s Morning and TODAY show. She is a popular presenter for her simple dishes, great advise and wonderful ideas for simple sustainable ideas we can all try at home. Rebecca is also an OZ Harvest, BALL USA and writes for Broadsheet, CityMag, SA Gardens, Sweet, Alquemie Magazine, NITV and ABC Organic Gardener to name a few.